I’ve already written about my experience as a US Citizen Married in Scotland. If you’re getting married in the UK, start there to understand the procedure for the wedding. What follows is the next steps we took after the wedding so that I could stay in the country with my husband. Before we get into all the headaches involved, here are two fun wedding photos! *All our wedding photos are courtesy of Carolyn Henry Photography. 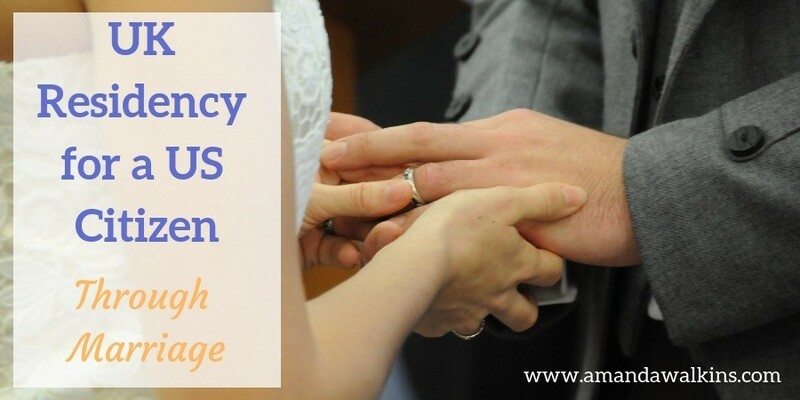 How Can a US Citizen Get UK Residency Through Marriage? First things first, you need to be married to an EU Citizen. If you’re married to a UK Citizen specifically, good for you! You will have to follow different steps. If you’re already in the UK and married to a UK Citizen, you can follow these instructions from the Home Office. If you’re outside the UK and applying to join your UK Citizen spouse, then take a look at these instructions instead. My husband has Irish citizenship, so while we have the right to live and work anywhere in the EU, we still have to follow the unique visa rules for every country (including his own). In the UK, we needed to file for an EEA Family Permit so that I could stay. Bonus level of red tape: I could have applied to remain in the UK with my “settled person” spouse. He was raised in Scotland and could have been considered settled. With that option, the visa only takes 8 weeks to process, but it costs £993. You could pay for premium service at a whopping £1,583 and receive your visa within a matter of days. We don’t have that kind of spare cash lying around just for the right to live together in my husband’s home country. But the only other option in case you can’t pay is to apply on the basis of destitution. It’s a 19-page application filled with in-depth financial information just to waive the hefty fee. I filed as an EEA Family Member instead, which takes longer but only costs £65. Depending on whether you get married in the UK or elsewhere will also dictate how you apply for your residency. We were married in Scotland and then immediately applied for my residence permit to stay. If you’re outside the UK, these rules are different. If you’re inside the UK and married to an EU Citizen, you’re in the same situation I was in. The Home Office site has a note saying you don’t actually need a residence card as a family member, but I cannot imagine an immigration officer happily allowing me in and out of the country on an American passport with only a marriage certificate to back up my claim that I’m allowed to stay more than six months. From the UK government website. That makes zero sense to me unless you never leave the island. While it might be a big island, it’s still an island and every form of travel from there requires a passport. If you’re a US Citizen married to an EU Citizen and coming to the UK to live, you do have options for your residency. There are student visas and work visas in addition to the spouse visa. If you do obtain UK residency through marriage, you’ll be granted the right to work immediately. Visa processing and waiting times all vary, and it’s easier to change some visas than it is others. Costs vary and sponsors are involved with each type of visa – meaning if your circumstances change by way of graduating, losing your job, or getting divorced, you can lose your right to stay as well. If you want to stay in the UK forever versus just studying or working for a few years, that will also determine your visa needs. These are all questions you need to ask yourself before starting the UK residency process. After we got married in Edinburgh, this was my experience as a US Citizen. Every situation is unique and yours will undoubtedly raise more questions than I could possibly answer here. But I found it very helpful to read other people’s experiences as I was researching what I needed to do, so I hope this helps. I recommend you start working on your application form before the actual wedding. I know, you have other things on your mind. But, trust me here, the last thing you want to do after a fun event like a wedding is sit down to fill out a 100-page legal document, plus round up all the supporting documentation you need, plus start on those thank-you notes. That brings up the supporting documentation. When applying for your UK residency as the US Citizen spouse of an EU Citizen, you will have to submit your and your spouse’s passports. The actual passports. You will not receive these back until the application process is complete. That means you cannot leave the country at all for any reason. If you must leave the country, you can submit a request to receive your passport back from the Home Office. That cancels your application, you lose your fee paid, and you start all over again when you submit again later. For that reason, you’ll want to consider travel and upcoming events as you plan the timing of your application. If you have a reason to leave the country within the next eight months, I would hesitate to apply. Mine took seven months and Brexit has undoubtedly further complicated all Home Office matters. If you can apply from within the UK for the right to remain with your UK Citizen/Settled Person spouse, then you can pay for a faster processing time as mentioned above. That’s up to you and your situation. Having now gone through two different residency application processes in the EU, I can say wholeheartedly that the UK residency application is insanely long. Not all of the 100 pages will apply to you, but you do have to go through every single one with a fine-tooth comb to be sure you don’t miss anything. Super great bonus (/sarcasm): Because of Brexit, the UK Home Office has been – and likely will continue to be – overrun with applications to manage. That means wait times are extra long and you’re in limbo during that time. In my personal example, I applied for residency immediately after our wedding. The Home Office received everything on February 4th. I finally received my residence card the first week of September. Yes, that is seven months of waiting and I have zero red flags and required no additional information. Again, this is for a US citizen getting UK residency through marriage as the spouse of an EU Citizen. There are many different pathways for residence and many variations in forms and processing times because of that. I imagine that length of time that I faced may be normal for the foreseeable future given the number of EU citizens living and working in the UK who did not previously require residence cards. The application itself is around 100 pages long. Around 45 of those pages specifically applied to me, so I only printed and filled out those pages. Throughout these pages, I had to fill in ample details proving our marriage, both of our birth and citizenship details, former residences, you name it. It was a tedious process to stay the least, so I reference back to my recommendation that you start doing it before the wedding. If English isn’t your first language, you will likely need to hire a solicitor to help you get through all of these forms. Even though English is my first language, legal language is altogether different! In 2016, the cost for a US Citizen to get UK residency via marriage to an EU Citizen was £65 for the residence card itself, plus an additional £19.20 for my biometrics to be completed at the Post Office. If you apply to remain with your UK Citizen/Settled Person spouse, the fees mentioned above will apply. More information from the Home Office is here. If you apply from outside the UK to join your spouse, the fees are listed here on the Home Office website. Spoiler alert: the fee to join your spouse is almost as high as the fee to remain with your spouse on the premium rate. Ouch. In addition to those application fees to remain or join your UK spouse, you’ll need to pay the Healthcare Surcharge. The fee structure is listed here, but if I was applying as a UK Citizen’s spouse it would’ve been an additional £1000 for healthcare. Again, ouch! This is to give you an idea of what to gather, but you have to check your specific requirements before submitting. Again, these were required so I, as a US Citizen married to an EU Citizen, could apply for UK Residency from within the UK. If you, like me, don’t have a printer at home, you’ll need to pay to print out all the application pages plus make copies of everything for safe keeping. I used my local library and made friends with the lovely librarians there. I was there a lot. I also made friends with the folks at the post office while mailing the application and asking a million questions to ensure it would arrive at its very important destination. They then had the pleasure of seeing me on a regular basis as I mailed out thank you notes to multiple countries. When you receive your letter telling you to complete your biometrics, you can head to a post office branch that offers this specific service. Mine did not, so I had to take the 40-minute bus into Edinburgh to pay for my photo and fingerprints to be taken and submitted to the Home Office. I was overly optimistic that doing my biometrics meant I was nearly done and should have my passport in the mail soon. It was still several months later before it arrived. Mostly because the Brexit vote happened about a month after I sent in my biometrics. I was originally told it could take up to six months to process, and it was in six months exactly that I received our two passports back in the mail. However, it took another four weeks for my residence card to arrive. In the meantime, I couldn’t leave the country (nor even book travel in case it didn’t show up) because there is nothing inside your passport indicating you have a right to stay. The residence card is your only proof. And before it arrives, all you have is a letter from the Home Office confirming that they’re reviewing your application. A key point here is that you do have the right to work while they review your application. That confirmation letter is your proof for your employer. It is dated and says that the employer should require your residency card six months from that date, which obviously wouldn’t have worked out in my 7-month case. Luckily, I freelance. By the time I finally received my UK Residency card, I was very ready to leave the UK. The Brexit vote made our move there useless since my husband is Irish. If we stayed long-term and I eventually received a UK passport, Brexit meant that he and I still couldn’t live in the same country easily. Also, there was no way I could stay in that climate long-term. Marriage makes it easier to prove the legitimacy of your relationship to governments, but it certainly does not open all doors. Being in a bi-national marriage is just a little more complicated, no matter what. Our recent move to Malta was dramatically easier to apply for residency – for both of us. Again, it was EU Treaty Rights that enabled me to apply as an EEA Family Member for the right to stay and work here. My husband’s application for a residence card was very straightforward and quick. Mine as a US Citizen married to an EU Citizen was still very straightforward but takes a while longer to process. I hope this helps if you’re going through a similar situation right now. I’m happy to try to answer any questions, but please know this is only my personal experience and I am not a lawyer/solicitor/barrister – whichever word you use! Keep yourself updated on changes in immigration law, especially given the Brexit ordeal. The UK Government site is complicated, but, if you spend as much time on it as I did, you’ll become familiar with their somewhat cumbersome format. Was this helpful? Go ahead and pin it! If you want to see more about our lives in Scotland, take a look at this page. We’ve also lived in Roatan, Ireland, and now Malta! You can keep up with me on Facebook, Instagram, Twitter, and Pinterest as well. Cheers!